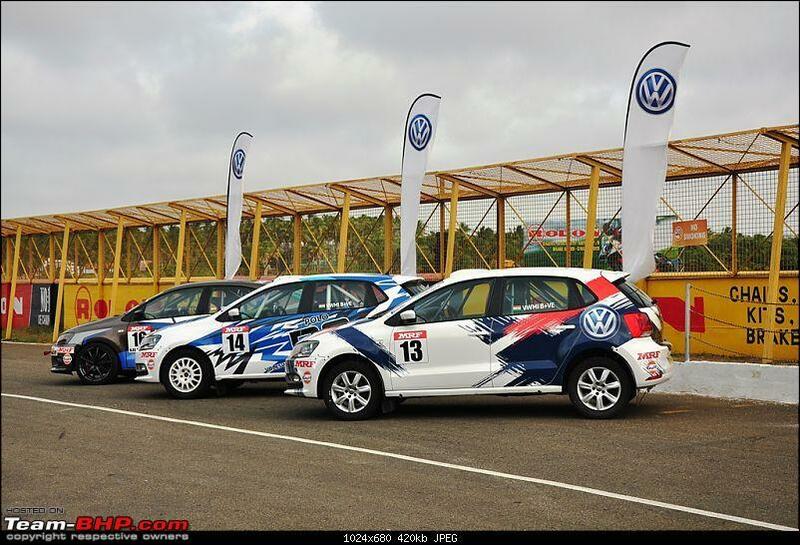 Volkswagen has been making 'developed in India' and 'Made in India' track spec cars - first the diesel and then the petrol Polo, then the Vento and now the Ameo for their one make series and the Motorsport division inside VW India will now sell their track cars to individual owners too. 1. Customers will be offered a choice of two cars to choose from. 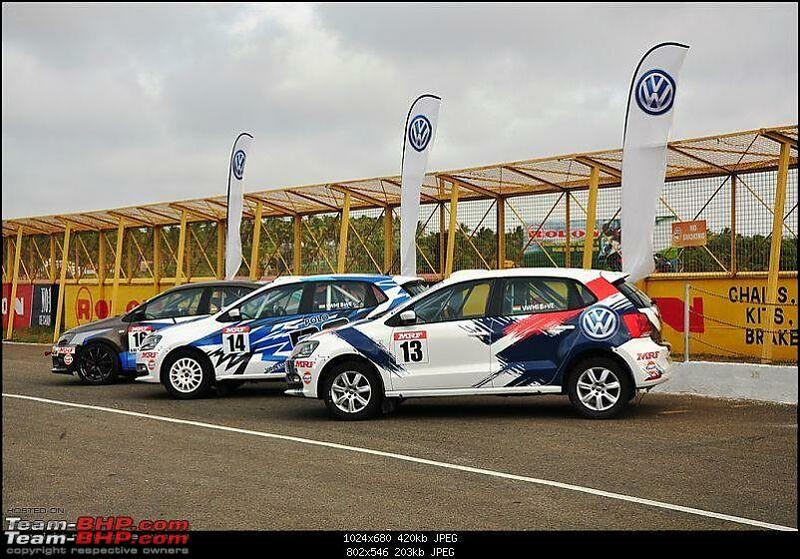 The first will be the Ameo Cup racecar that currently does duty in the Volkswagen Ameo Cup races. The car sports a full race built 1.8-litre engine, a BMC intake and a sequential gearbox with a full auto mode that makes the car an absolute beast to drive. You also get a full FMSCI spec rollcage, a seam welded body structure, a race ready fire extinguisher and an OMP race seat. 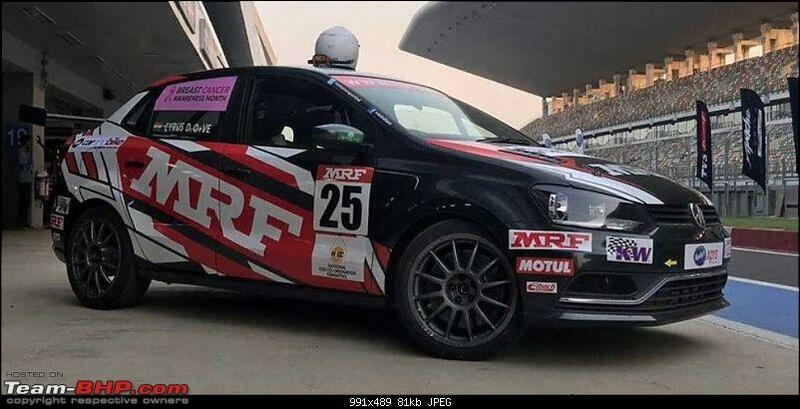 Well, all in, the Ameo Cup car - with that massive rear wing will be available to customers for about Rs 40 lakh, which considering the fact that it is about 205 bhp and can lap the Buddh International Circuit in under 2:20:000 is impressive. 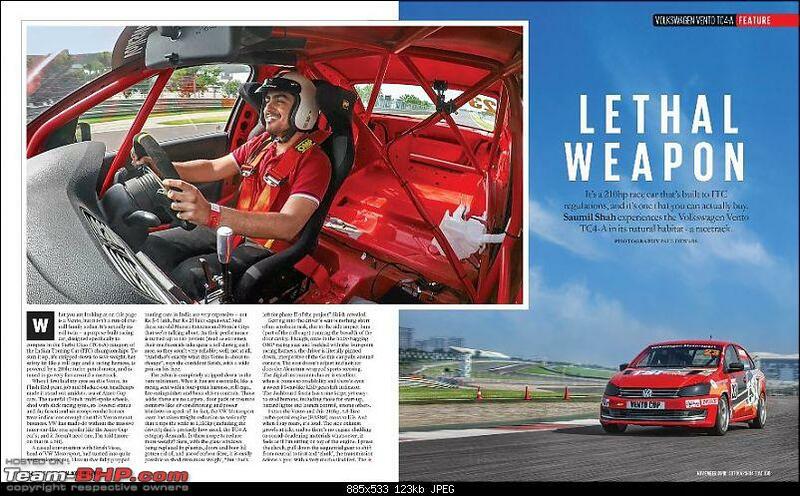 The race spec Vento gets the bits like the rollcage, the race seats and harness, the KW suspension with Eibach springs and the fire extinguisher. The race spec Vento also gets the usual bits like the rollcage, the race seats and harness, the KW suspension with Eibach springs and the fire extinguisher. 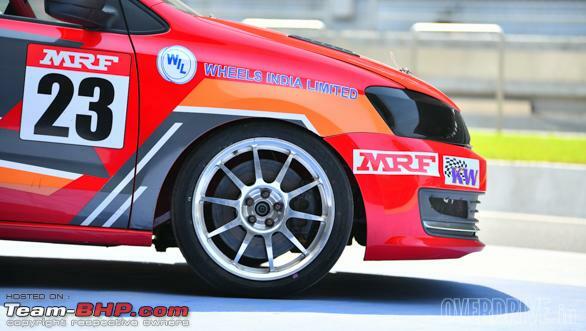 It also gets a set of forged wheels that have been made specifically for this car by Wheels India Limited in India and weight only about 6.5 kg each! The race spec Vento does not get the same wing as the Ameo does but owners can opt for one. The car also gets massive front brakes from a Golf R32 along with rear discs from an Octavia RS comnbined with a set of race ready brake pads. The base model car with no options ticked in will cost about Rs 24 lakh while the fully loaded version with all the trinkets added in will be about Rs 40 lakh - the same the Ameo Cup cars. But that isn't all! 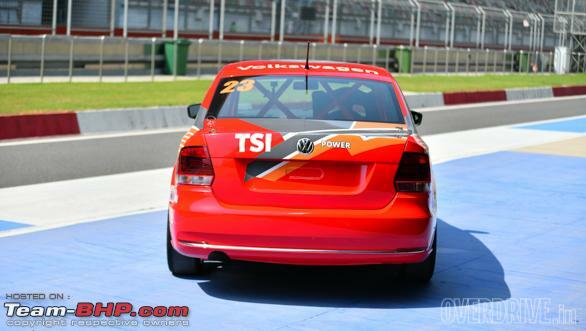 Volkswagen Motorsport India can also offer a different map on the Vento, which will boost power upwards of 300 bhp and can also develop and offer front aewro like a splitter and a set of canards along with more aggressive rear aero. Both these cars are for track use only and cannot be registered on the road. Pretty cool, but the price & track-only nature means it'll have just a handful of takers, all of whom will be from the professional racing scene. For people like us, VAG's own road-legal Octavia vRS is a far more compelling option . That's an out of the box thinking to extend the sales. However, I have some of these questions. 1. Are these the cars which are already used in the race & refurbished or brand new? 2. What about service / maintenance of these cars? Again restricted to places where we have tracks where VW may have a team dedicated to look after these cars? 3. What are the external visual differences these cars have Vs stock cars? Anything major that the regular cops / RTO guys could make out while on road (may be save for the loud exhaust)? 40 lakhs sound quite steep. The question is how many will spend that kind of a money for just a track purpose. The Evo X which was meant for all day driving + a track machine (with a 360 bhp or was it 300?) could only move a total of less than 10 units in India IIRC. PS: Those who are familiar with the race scene - can't we build a race spec car with good garages for an additional 10L or so? May be the likes of Leela Krishnan could be expensive, still? Last edited by swiftnfurious : 10th October 2018 at 08:53. That's really some out of the box thinking but one which hardly have any impact on their dwindling sales. Why don't they offer a vRS/GT version of their Vento instead? The 1.4Tsi with a manual box and tweaked steering and suspension would definitely get some more people to their showroom! These cars will be bought only by those in the Motorsports scene. Not much. So, not really a move to push sales, but, rather I would say its an excellent move to push the brand image ahead. 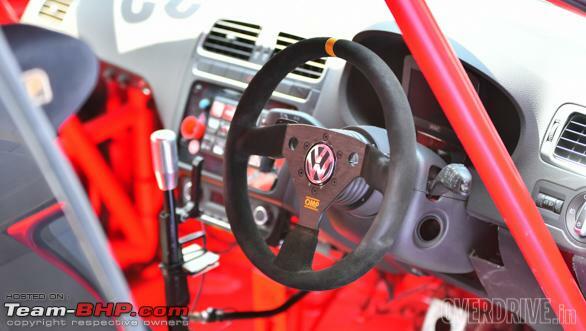 This will lead to more VW cars in the rally scene. And lead to the perception of their cars being super driver friendly. .... PS: Those who are familiar with the race scene - can't we build a race spec car with good garages for an additional 10L or so? May be the likes of Leela Krishnan could be expensive, still? There are people who swear by tuners, but, I'm sure new entries will definitely opt this. And not tuners, especially since building a car with a tuner is like starting a relationship. AND - This is Factory Tuned! Last edited by dhanushs : 10th October 2018 at 10:39. 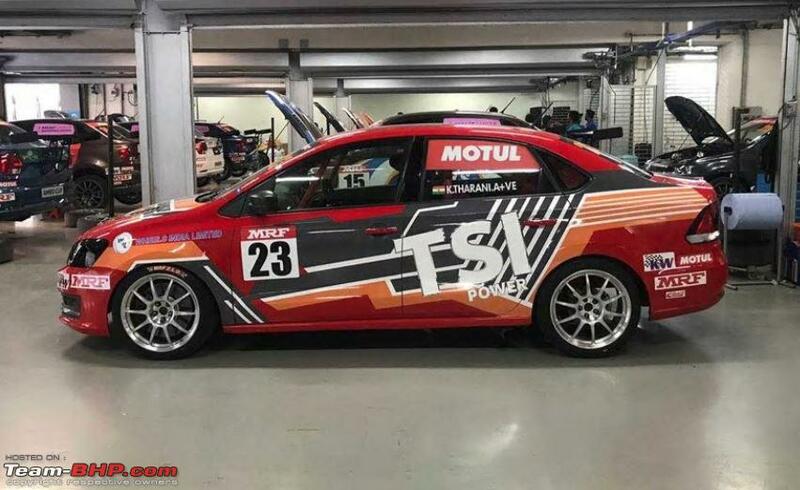 This looks suited to enthusiasts with spare moolah to hone their track skills (and of course if they get noticed by the right people at VW Motorsport HQ, may get sponsored by VW for one of those one make series organised by VW). On a separate note, here's a wicked thought. Why not pick a pre-worshipped (road legal) sports coupe (say an M3/RS5/C63,etc.) for roughly same ball park figure, give or take 5 lakhs here and there, and enjoy every day practicality + track use as an when one chooses? In any case, with the quantum of mods going into these Ameos/Ventos , they wouldn't be anywhere nearly as reliable as their road legal mass-produced versions. Last edited by octane1002 : 10th October 2018 at 22:10. Quoting a relevant bit from my experience of driving the Ameo Cup car in June 2017. 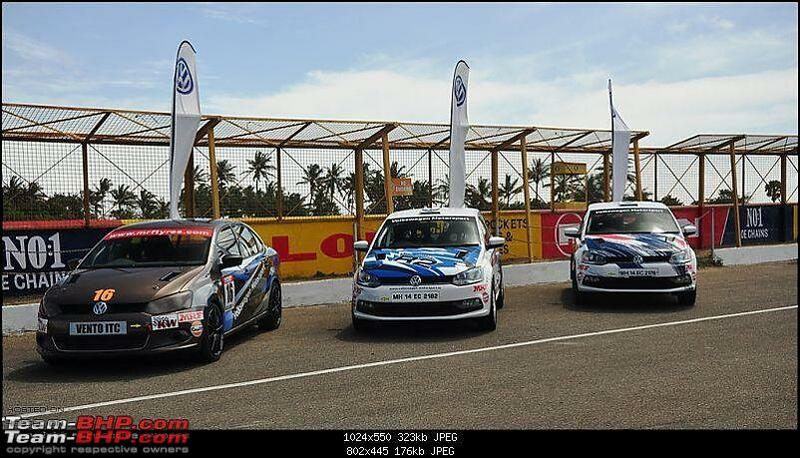 ...[*] The following 3 cars parked around the pit-lane were special. From right to left they were the N, R series and circuit-racing spec. These are race-spec cars that are apparently street-legal. They are made to order and are customizable. IIRC, they did mention that these machines are street legal. In fact you can see registration numbers on the 2 Polos on the rights. 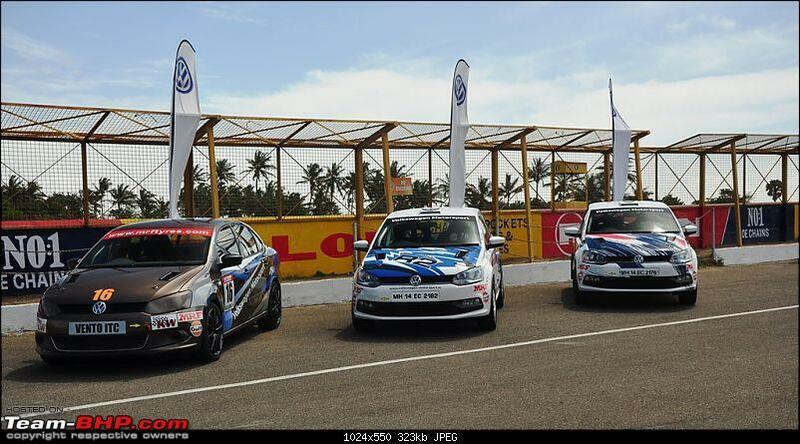 So now I am not sure if there is a change in direction from VW Motorsports side (track machines v/s street-legal) or may be this is part of a different initiative. Last edited by SDP : 11th October 2018 at 15:31. 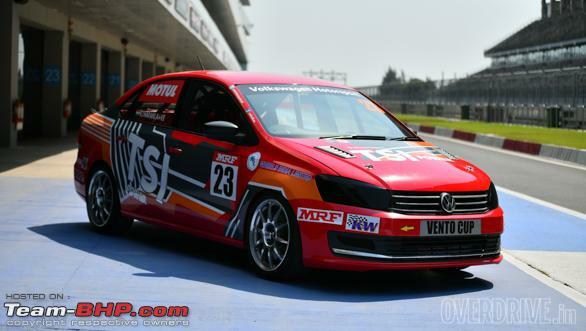 Volkswagen Vento TC4-A Racecar - All you need to Know! 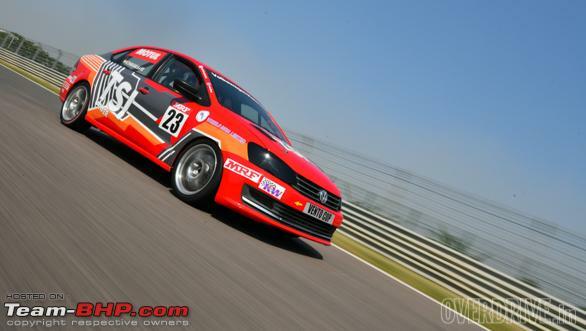 Volkswagen Motorsport took a road-going Vento sedan and created this racecar. Visually, you can see that the driver's door has a door pad, primarily because of the door handle and the manual window winder. The other doors are hollow, although they do still run glass windows because the TC4-A class has a high-ish minimum weight - to keep costs in check and allow more manufacturers to easily create racecars. The dashboard is just about there, but the meters, the centre console, all feature racecar essentials rather than creature comforts. Behind your race bucket - there's only one seat - is a massive roll cage and empty space that runs all the way back to the boot lid. The body is stock, more or less, the tail lights actually work but the headlights are empty. the whole car is seam-welded for longevity. A street car has the minimum of spot welds it needs, to stay together over its street life. A racecar with its additional stresses and performance, in a year or two, will crack those welds. So they welded all the seams on the Vento TC4-A through and through. They strip out all insulation - hence the noise and the heat. If the weight limit is low, you'll also get plastic windows. 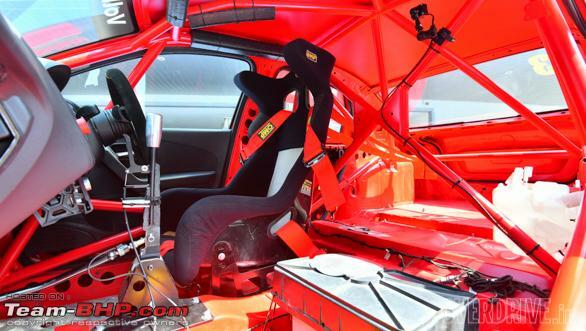 Then comes the installation of the roll cage, the OMP racing seat and six-point harness. 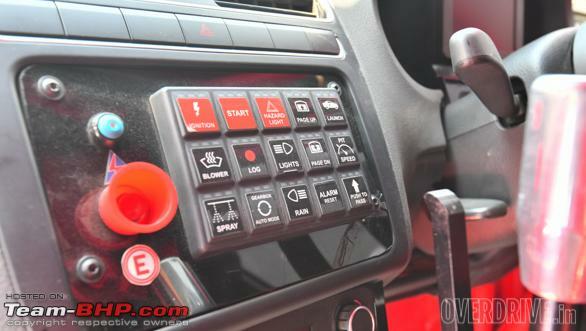 Finally, there's the tiny steering wheel. 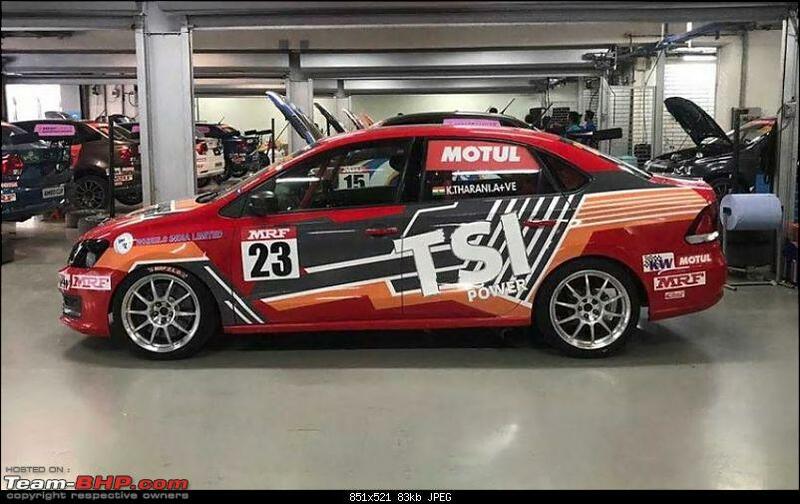 1.8-litre TSI engine they use, has proven to be an extremely robust racing platform, working happily with just one oil change and service per season. The turbo runs a restrictor plate as per the class regulations and allows the engine to make 215PS. 250PS would be possible without the regulatory requirement. There's a minimum of engine work but the gearbox is a race gearbox from French company 3MO. 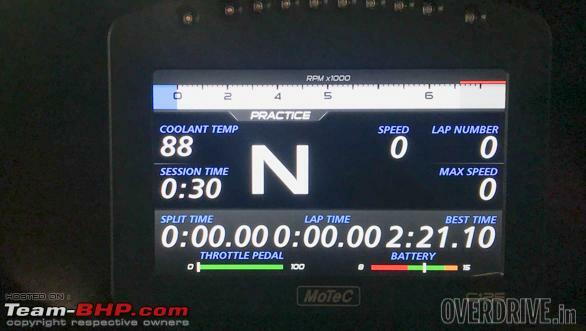 MoTec supplies all the electronics, including gearbox electronics. I wish VW Motorsport would open up and support existing Polo, Vento owners and convert their cars to these track spec monsters. Basically convert my Polo GT into a GTI+ with factory parts and expertise. I guess RC book related issues is a grey area, but VW might be able to figure it out. P.S: Do we know if anyone has bought these?